Chinese New Year will begin in a few weeks and just thinking about it is making our mouths water for things like noodles, dumplings and Peking duck. If you’re in town the week of Feb. 8 celebrating the Year of the Monkey, we suggest you grab a great meal at one of Vegas’ many Chinese restaurants. We’ve got everything from the most authentic cuisine to modern twists on traditional food. Here are some of our favorite places to cure those Chinese food cravings. 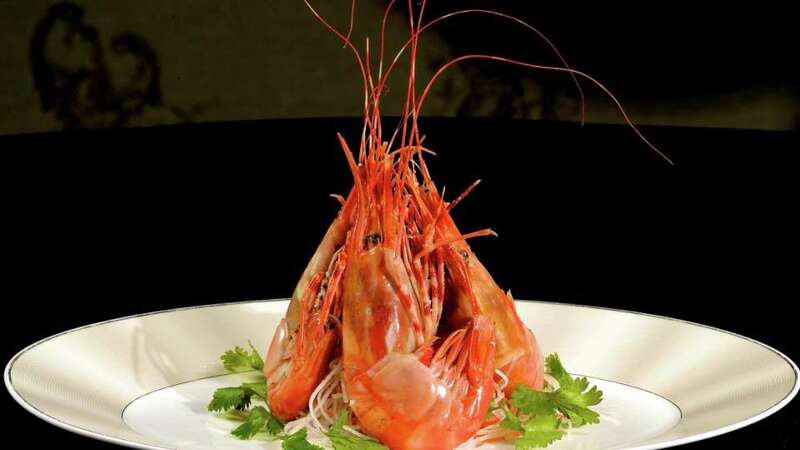 The signature green prawns at MR CHOW, photo courtesy of Caesars Entertainment. The celebrated MR CHOW, which has locations in several other cities, recently opened a restaurant in Vegas. 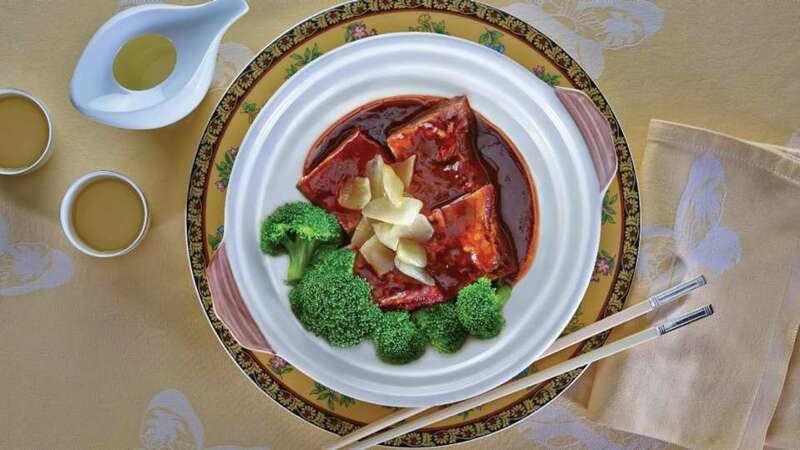 The Beijing cuisine is served family-style in the traditional Chinese way. Start out with an array of appetizers like chicken satay, scallion pancakes, chicken curry puffs, squab with lettuce, dumplings and pot stickers. 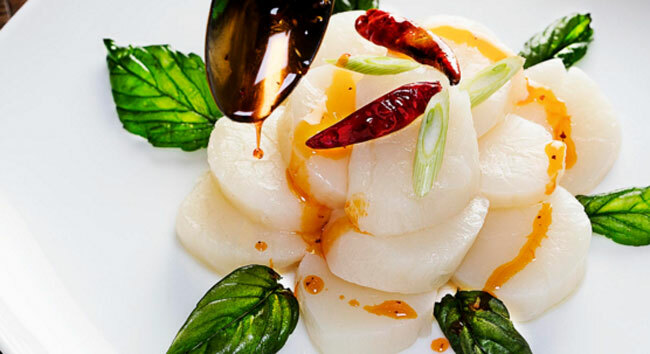 The main menu includes seafood like the Drunken Fish, which is poached in wine, squid in XO sauce, MR CHOW’s famous green prawns and fresh live lobster. For the non-seafood eater there are meat dishes available like Beijing chicken with walnuts, spicy pork with chili, lamb shank and Gambler’s Duck, served with steamed pancakes and plum sauce. For those who want to stick to veggies, you’ll find some delicious options like four color cauliflower, exotic mushrooms, fresh yellow chives and asparagus and sautéed baby bok choy. 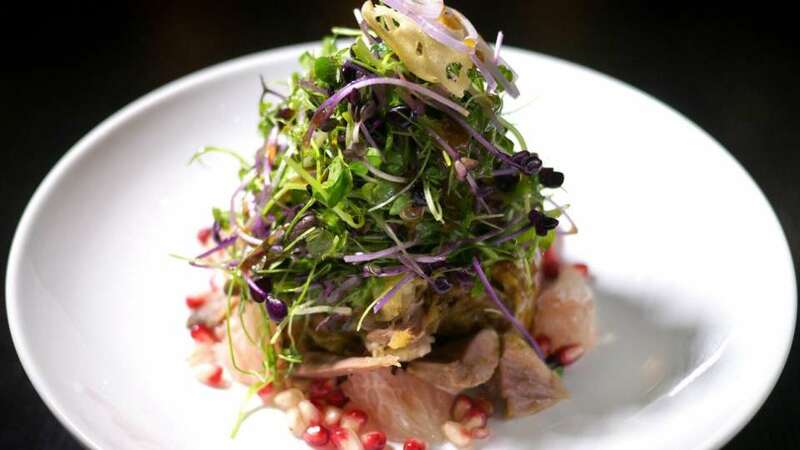 The signature duck salad at Hakkasan, photo courtesy of Hakkasan. Going out dancing at Hakkasan nightclub? Stop into the adjacent Hakkasan Restaurant to fuel up before you go. The restaurant serves modern Cantonese cuisine from Michelin-starred Chef Ho Chee Boon. For Chinese New Year, Hakkasan will be serving a special menu designed to bring you luck, joy and prosperity in 2016. Who couldn’t use that? Priced at $138.88, the menu is accompanied by an exclusive cocktail and dessert inspired by the Year of the Monkey. The menu will include ginseng and chicken soup; diced Wagyu beef and pine nut golden cup; and a steamed dim sum platter. Main dishes are wok fried lobster; Pipa duck; roasted Chilean sea bass; Hericium mushroom stir fry; and dried scallop and crab meat fried rice. For dessert, guests will enjoy the Golden Halo with soy caramel, banana delice, chocolate and peanut. Hakkasan is giving all guests who dine from the Chinese New Year menu a specially designed Year of the Monkey coin as a gift of good fortune. The celebrations will run from Jan. 22 – Feb. 22. This restaurant was named one of the top 10 Chinese restaurants in America by Travel + Leisure magazine so it’s definitely one to try. You’ll find authentic dishes from various provinces throughout China. Starters include things like minced squab lettuce cups, salt and pepper calamari, sesame shrimp rolls, salt and pepper frog legs, braised oxtail with red wine and chitlin hot pot. The menu features a variety of fish, meat and poultry dishes. Seafood fans can indulge in walnut prawns and Manila clams with black bean sauce. Meat dishes include classic Cantonese brisket stew, house style braised pork belly and Mongolian beef. You’ll also find rice and noodle dishes like Hong Kong won ton noodles, Singapore rice noodles and beef flat rice noodles. If you are looking for a great lunch spot in Vegas, check out Ping Pang Pong’s popular dim sum lunch. Wing Lei, photo courtesy of Wynn Las Vegas. Wing Lei was the first Chinese restaurant in the country to be awarded a Michelin star so you know you’re getting something special here. The restaurant features a view of a private garden that’s home to century-old pomegranate trees and a golden dragon statue. Not only is the view beautiful, but the food is a beautiful mix of Cantonese, Shanghai and Szechuan flavors. Appetizers include a Peking duck salad and honey-glazed BBQ spare ribs. For seafood options there’s spotted prawns, Pacific spiny lobster, Alaskan geoduck clams and Maine lobster. Meat and poultry options include sweet and sour pork, garlic beef tenderloin and lemon chicken. 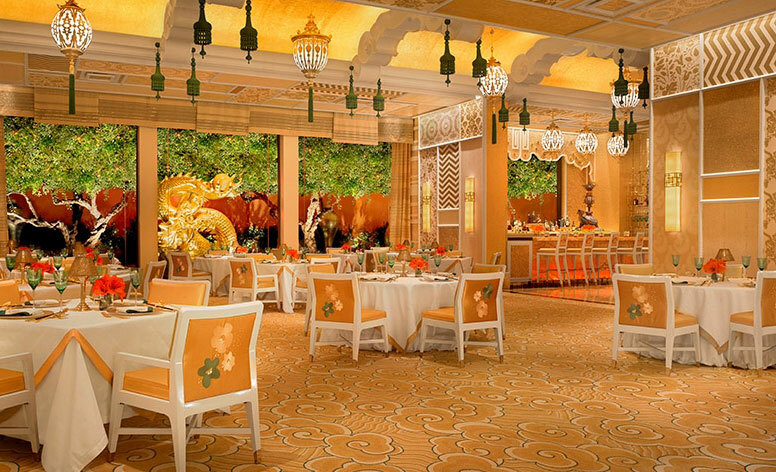 As at all Wynn restaurants, there is a vegetarian menu and Wing Lei offers items like tofu spinach soup, braised tofu and vegetable fried rice. Finish your meal with a premium tea selection and desserts like lychee-prosecco jelly, pistachio macaroons and mochi ice cream. Beef short rib at Jasmine at Bellagio, photo courtesy of Bellagio. Jasmine serves traditional Hong Kong Cantonese food in a beautiful setting overlooking the lake at Bellagio. The dining room is filled with authentic and replica Chinese art. Enjoy the view while you dine on things like crispy eggplant and pan seared scallops. Barbecue options include the signature Imperial Peking duck and Szechuan roasted chicken. There’s live seafood available including Maine lobster, Dungeness crab and Santa Barbara prawns. Meat lovers will appreciate the braised Kobe short ribs, wok-fried flank steak and braised spareribs. China MaMa, 3420 S. Jones Blvd. If you’re looking for authentic Chinese favorites, head to China MaMa in Chinatown. The popular restaurant serves things like spicy pig ear, stewed beef shank, hot and sour soup, a variety of rice dishes and hand-pulled noodles including chicken chow mein, beef chow mein and beef stew noodle soup. For dessert, try the red bean pancakes and steamed red bean buns. Enjoy a menu full of live seafood options at Joyful House. Photo courtesy of Joyful House. Joyful House, 4601 Spring Mountain Rd. This restaurant, located in Chinatown, is the real deal with authentic Chinese cuisine. You’ll find things like shark fin and a variety of abalone and sea cucumber dishes including fresh abalone in oyster sauce, dried sea cucumber in oyster sauce, sliced abalone with seasonal greens, and braised sea cucumber with black mushrooms. 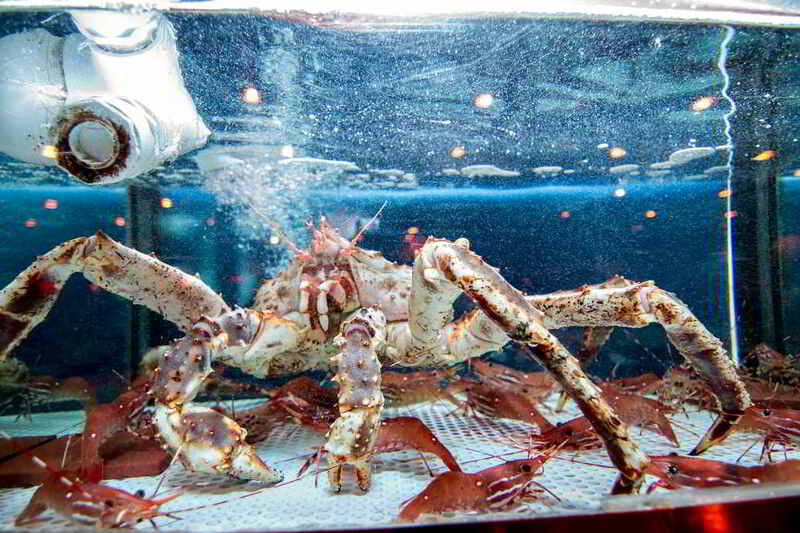 There are a lot of live seafood choices like Pacific lobster, Alaskan king crab, Australian lobster and New Zealand crystal crab. For those who aren’t seafood fans there are plenty of beef and poultry options such as beef tenderloin mignon and portabello mushroom in black pepper sauce, orange blossom beef and spicy Mongolian beef. You can also enjoy the classic Imperial Peking duck, steamed free range chicken and sizzling chicken in black bean sauce. The extensive menu also includes noodles, rice, vegetables and tofu, as well as clay pot meals. If you like things spicy, you’ll want to try Lao Sze Chuan, named after the province from where the spicy cuisine originates. The restaurant is from renowned Chicago chef Tony Hu and is the seventh location of the popular Chicago-based restaurant. 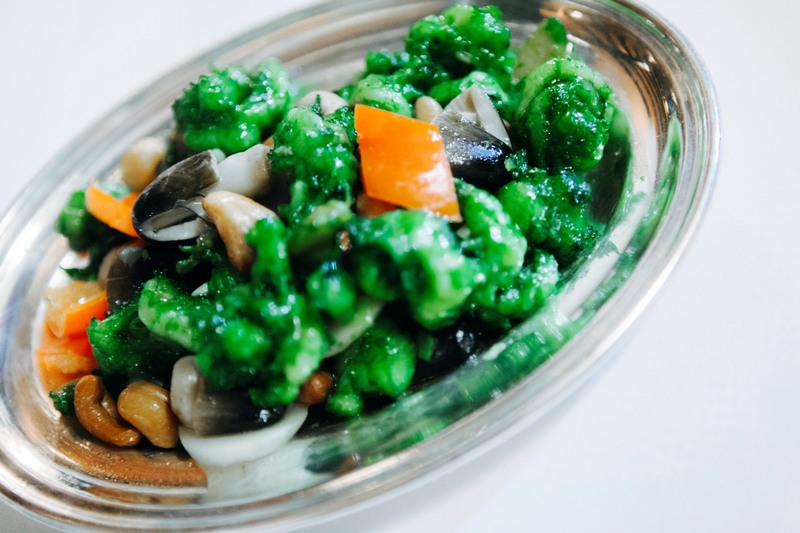 You’ll find a large menu of Sze Chuan cuisine and a selection of popular Mandarin, Cantonese, Hunan and Shanghai dishes made especially for the Palms location. Taking frequent visits to China to research culinary trends, Hu continuously modifies the menu to reflect the latest in Chinese cuisine. Appetizers include cold noodle salad, garlic cucumber and egg rolls. Seafood choices include salt and pepper squid, kung pao shrimp, cashew shrimp and sweet and sour prawns. There are also a variety of beef and lamb dishes like honey garlic pepper beef tenderloin, lamb with pure cumin and Mongolian lamb. Chicken and duck options include a chef’s special dry chili chicken, sesame chicken, Szechuan smoked tea duck and crispy duck. Be sure to try the Cantonese specials like pan-fried buns, seafood delight with choice of XO sauce and fried tofu with baby shrimp. Beijing Noodle No. 9, photo courtesy of Caesars Entertainment. Beijing Noodle No. 9 has a 14-page menu so there should be something to satisfy you no matter what you’re craving. Walk through a dramatic entrance flanked by gigantic fish tanks and get ready to indulge in Northern Chinese signatures and specialties. Beijing pancakes, won ton soup, fried rice, and dim sum of all kinds are top picks here, with your choice of vegetables, pork, chicken, seafood or beef. Noodles are a must for any Chinese hot spot and they’re hand-made every night at Beijing Noodle No. 9. You can choose from soup noodles, sauce noodles and wok noodles. Live seafood includes prawns, Maine lobster, crab and cod. 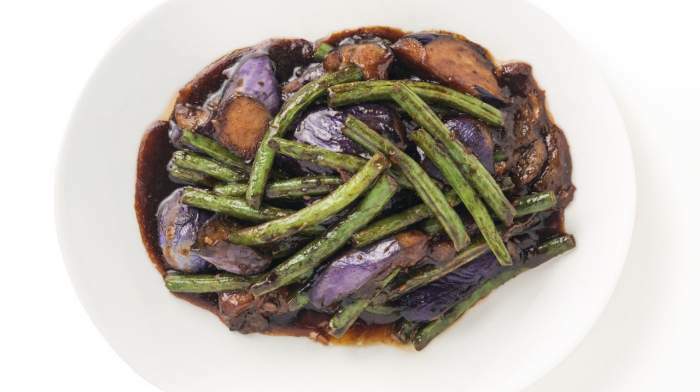 Beef and chicken dishes like wok seared Kobe beef with black pepper sauce, stir fried prime sirloin with string beans, General Tso’s chicken, and crispy chicken in Sichuan sauce are also on the menu. A shrimp dish at Blossom, photo courtesy of Aria. Blossom serves traditional Chinese food as well as some Americanized versions of Chinese favorites. There are 100 dishes to choose from. Start out with egg rolls, pot stickers, tempura-fried ice fish and barbecued back ribs. Move on to live seafood from the on-site tanks including clams, sea bass, lobster, crab, walnut prawns, and Szechuan shrimp. Meat choices include Peking duck, kung pao chicken, mandarin pork chop and Mongolian beef. If that’s not enough there are also noodles, fried rice and hot pot meals like ox tail and spicy chicken. Photo courtesy of Hong Kong Cafe. Hong Kong Cafe serves an eclectic mix of Asian cuisine and Western fare. The menu starts with Asian appetizer specials like pot stickers, spring rolls, pork buns and edamame. Entrees include things like oven roasted duck, Macau-style roasted pork belly, Kung Pao chicken, honey glazed walnut prawns and baked Chilean sea bass. There are also Vietnamese specials, fried noodles, soups, rice dishes and more. The Hong Kong part of the menu features things you might find in the city including Spam and egg with instant noodle soup, Hong Kong style French toast, a pineapple bun with iced butter and minced chicken with sweet corn soup. There are also Western dishes like baked pork loin, oven baked spaghetti with black truffle and chicken, curry dishes and fish. Hong Kong Café’s Chef Simon To has created a special limited-time menu to celebrate Chinese New Year. A variety of authentic dishes are on the special menu including: roasted pork belly; firecracker Manila clams, infused with Chinese white wine, fish paste, and spicy roasted pepper; and Winners Daily Soup, which is a must-have for all casino players. After you’re done eating your Chinese meal, check out some of these other ways to celebrate Chinese New Year in Vegas.